On the bright illuminated display, you comfortably see the caller’s number, thanks to the caller ID features. And a directory with space for your contacts is also part of the package. 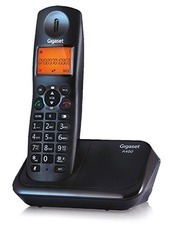 Other attractive features – such as hands-free talking, a standby time of up to 180 hours, illuminated handset keypad, 20 number redial, and more – round out the Gigaset C330’s offerings. We would like to bring forward to our clients an exclusive collection of Cordless Phones. Our phones are valued all across the country for their classy designs and speedy & convenient number dialing. These are appreciated for their ability to transmit sharp edged clear voice. Moreover, these are available with us at nominal prices. Overview VISIONTEK 21G GSM Desk Phone allows users to access voice calls communication on GSM mobile phone network with a SIM Card. Our FWP combines simplicity with advanced features. By capitalizing the skills and talent of our diligent workforce, we are able to provide best quality Cordless Phone. Conference call is possible by using this Cordless Phone. Also, our Cordless Phone is easy to handle and potable due to which its demand is increasing day by day. This cordless phone from Binatone offers the flexibility of using a mobile phone while retaining the charm of using a landline phone. Install it in your home or office for making quick calls to your loved ones, or to connect with your professional contacts.